I have just returned back from the jungle. I have done the trip with 3 English people named Matt with his wife and a friend. They have been visiting here for their third time. Beyond all our expectations, a magnificent adventure again! We had 3 days in our House Boating Accommodation. On our first day we were at Tanjung Harapan feeding station at 3 PM. We saw many orangutans around; there were some female pregnant and some mothers with their babys. After finish there we went up the river to see the Proboscis monkeys or called as long nose monkeys, again there were many of them hang around the trees in river bank we also saw long tailed macaques, Wild orangutans in the trees, silver leaf moneys, crocodiles, monitor lizards, fire flies, kingfishers, Horn Bill and Storm stork…. we saw it all! 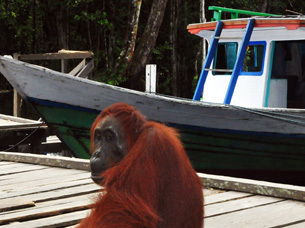 Of course, the real heroes of the journey were the orangutans. Second day we were at second feeding station named Pondok Tanggui, feeding time at 9 am, again we saw many orangutans, and also the dominant male orangutan named Doyok, he is very big! After that we kept going up the river to go to Camp Leakey, as usual we saw wild orangutans, kingfisher, black and red broadbill bird on our way back. We also passed the little black river. Why we call it black river? It is because the colour of the water is black, but clean. It is original water. Here there are many crocodiles along the river; we saw one of the big ones about 3 m long. Then when we arrived to camp Leakey there was one of female orang-utan named Siswi. She was waiting around the jetty. Siswi is the dominant female, and we call her the orangutan queen. It is sad for her right now because she has many wounds on her body; she had a bad fight with another orangutan. She is the one who can't be pregnant anymore because she had a big operation many years age. 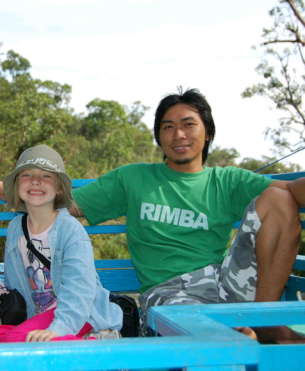 At camp Leakey we saw many orangutans, wild pig, and black handed gibbon. Camp Leakey is the higlight for the park. 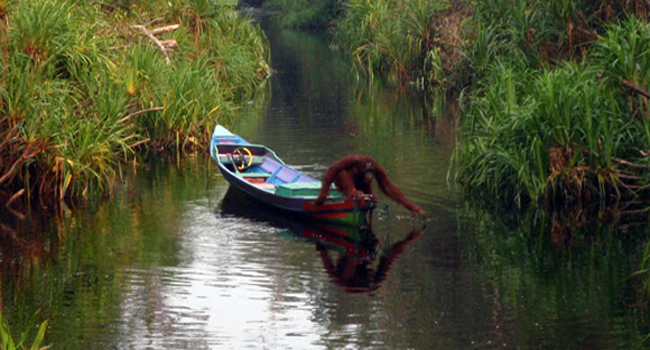 In the evening we went back down the river on our houseboat, again we saw many proboscis monkey then we stop around the Nipah Palm tree, there we slept with thousands of fire flies after the guest having romantic dinner. We had a great trip again! I am looking forward on my next trip on 21st-24th of June.